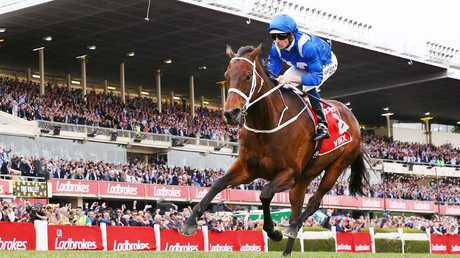 Winx must be rated Australia’s greatest ever racehorse, Bruce McAvaney says. LIKE many others who love the sport, I've lived all my life believing that to have seen the champion of champions, you had to be at Flemington in 1930. Thankfully, being at Royal Randwick ON Saturday was at least the equal to anything this sport has had to offer. Winx's performance in the Queen Elizabeth Stakes was the exclamation mark to a great Australian story. And it's a two-parter: there's the black and white of what Winx has achieved on the track, and then there's the colour and romance that makes our hearts sing. Her journey into immortality has been exhilarating and, indulge me, as I try to answer one of racing's toughest questions. 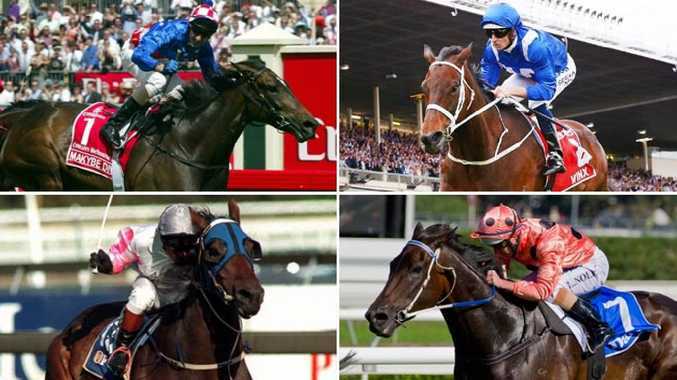 How does Winx compare with Australia's best ever horses? How does she stack up against the original five stallions and geldings that opened Australian racing's Hall of Fame? 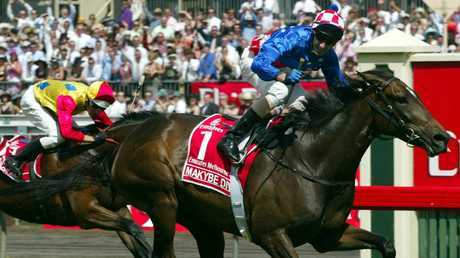 Glen Boss and Makybe Diva take out the 2005 Melbourne Cup, her third win in the great race. When rating the supreme Australian champion, those original inductees remain the benchmark. And since then, there's been a host of stars - Might and Power, Sunline and So You Think among them. The two greatest individual achievements have been Makybe Diva's three Melbourne Cups and Black Caviar's faultless career. But the Diva, although responsible for arguably the single most impressive achievement, was beaten in 21 of her 36 starts. She became a genuine top-class weight-for-age performer only in her final racing year. Black Caviar is the difficult one - because how can you beat 25 out of 25? But hers was a narrow CV in the distances she contested, not in the challenges she chased. Think Newmarket in 2011 and Royal Ascot the following year. There is a bias towards middle distance and distance events when it comes to assessing a thoroughbred's worth. Here's Carbine - here's what Winx is up against. Like Phar Lap, he won 14 races in succession - 16 of his last 17. His only defeat in that period was in the All Aged Stakes, in 1891, and he won another race later that same day. Things were different. At two miles, Carbine had nine starts for eight wins and had a worthy excuse - a split heel - when beaten by Bravo in the 1889 Melbourne Cup. Phar Lap was a headliner during the Great Depression. 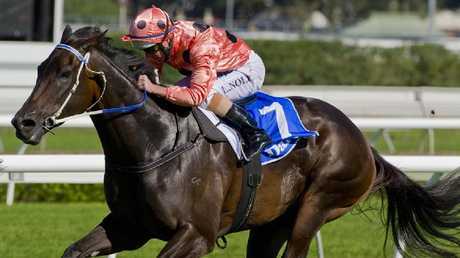 Over 2400m and beyond, Big Red recorded 18 starts for 16 wins. His two defeats were the Melbourne Cups of 1929 and 1931. He totally dominated his generation with winning streaks of eight, nine and 14, and won 32 out of his last 35. He had four wins in one week at Flemington. His celebrated final victory overseas made his sudden death all the more outrageous and devastating and he has a sentimental hold over this country. 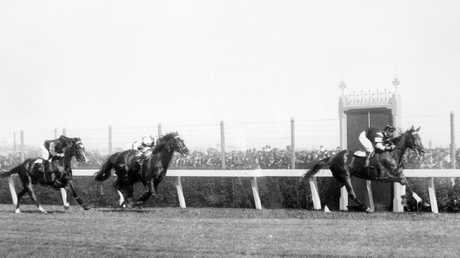 Phar Lap wins the 1939 Derby at Flemington. Bernborough was the whirlwind just a year after the end of World War II. He was denied a conventional juvenile career because of an ownership dispute, but his Newmarket Handicap/Doomben double in 1946 was the stuff of legends - 16 straight going into a Caulfield Cup, with more than 100,000 in attendance - and then a questionable ride followed by a serious injury a start later. Tulloch, as a three-year-old, had no peer. His Caulfield Cup win is remembered for the world record. For many, it's the single most impressive victory in the sport. But he lost so much time - his best, probably, through colic. And, when he came back, he ran as much on heart as he did on lungs. If only he had started in that 1957 Melbourne Cup. On the Saturday, he had won the Derby by eight lengths. One thing Tulloch needed to sit right alongside Phar Lap was the Melbourne Cup of 1960. Even without that, his farewell the following year was remarkable, as he won the Brisbane Cup before a frenetic crowd. 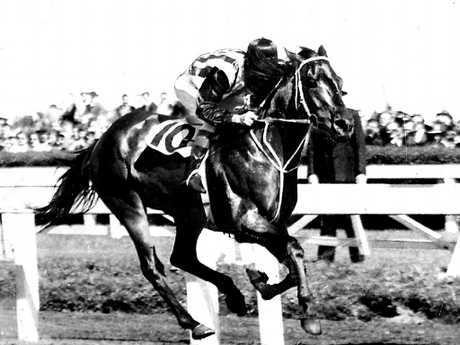 Tulloch, ridden by Neville Sellwood, wins the 1957 Caulfield Cup. Kingston Town did better in Sydney but was an all-time great at Moonee Valley. He was unbeaten in NSW for close to three years. Famously gelded after his first start, he was certainly the best horse between Tulloch and Winx over a mile and beyond. So, what does Winx have over them? Could she have beaten them? In the end, her achievements raise her up. Four undefeated springs and four undefeated autumns. Four Cox Plates, the Epsom/Doncaster double. Three Queen Elizabeth Stakes, a world record 25 Group One victories, 33 consecutive wins. • Another Cox Plate and another 10 high class races on top of that. When you add it all up, with all the Australian and world records she has achieved, what raises her above those previously mentioned icons or legends is quite simply that she was greater for longer. 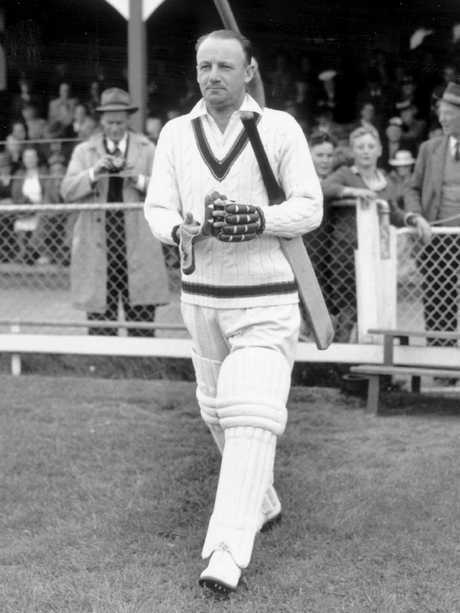 Donald Bradman’s Test batting average of 99.94 is one of Australian sport’s iconic numbers.. There are some iconic numbers in Australian sport: 99.94 - Bradman's average. 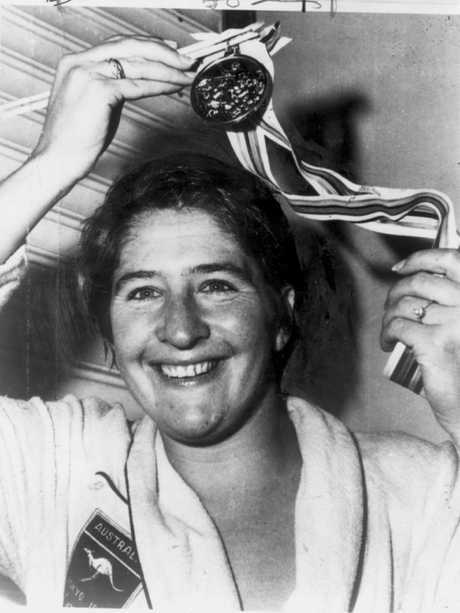 Three - Dawn Fraser's consecutive 100m freestyle wins. Twelve is the number of Melbourne Cups won by Bart Cummings. Rod Laver claimed two grand slams. 33-25-4. These are the numerals that now go alongside Winx forever. Consecutive wins. Group 1s. Cox Plates. It's a trilogy of figures that sits with the finest scores. I think for a racing fan, a sports lover, an admirer of the thoroughbred, being there to watch her Saturday at Royal Randwick was a little like going to watch Bradman bat for the final time. So that's her record. Her personality is something else again. Her relationship with jockey Hugh Bowman is a public one in this day of live broadcasts and social media. We've experienced with them their partnership as he takes her through the Randwick tunnel onto the track, on her way to the start. I love that quiet time they share, metres away from the stalls. Just the two of them, far from the madding crowd. The trainer, Chris Waller, is in the same class as Cummings and Smith even without Winx. He's a man of emotion, and we've shared his wild ride. And the owners - Peter Tighe, Richard Treweeke and Debbie Kepitis - have been equally embracing. The story is richer for their generosity. 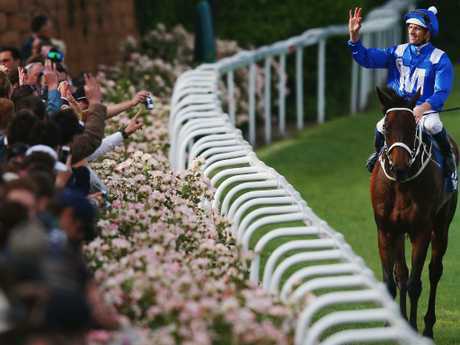 To witness the overflow of blue and white, the tears and laughter, the unbridled joy, the roar of the crowd on any day that Winx races has been an experience never to be forgotten. They've come from far and wide, those fans. With all sorts of backstories, they've shared a common conclusion: that watching her win has made it feel a whole lot better. Many years ago, three-time Melbourne Cup-winning trainer George Hanlon made his excuse to the stewards for one of his horses' poor performance. 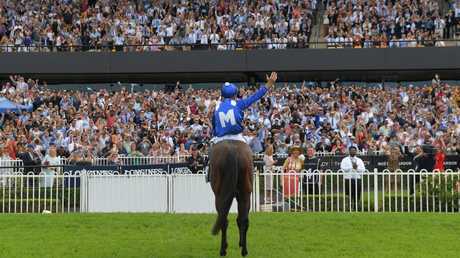 Jockey Hugh Bowman salutes the crowd after yet another Winx victory. "You can't blame them," Hanlon said. "They're only human." Strange to say, I feel that about Winx. I'm sure she knows she pleases. I'm certain she grits her teeth and enjoys running past the others and getting to that post first. And I know she loves the cheers and applause on her return. We have shared for her a commonality of affection. 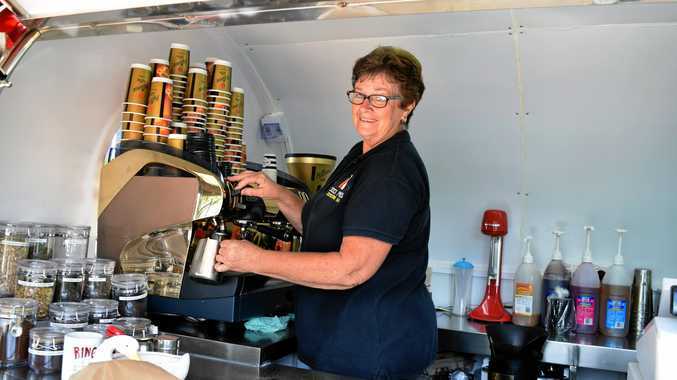 She has given racing and non-racing audiences a taste of what is good and decent about the Sport of Kings. I shall miss her and I shall share again and again the telling of the fairytale that is our own Winx. Swimmer Dawn Fraser shows off her Olympic gold medal that she received for winning the 100m freestyle at the 1964 Tokyo Olympics.